This is the Norwegian hardback edition of Talking God, the ninth book in Tony Hillerman's Navajo Mystery Series. This 1991 edition was published by Aschehoug in Oslo, Norway. The text was translated from English to Norwegian by Atle Bjørge. 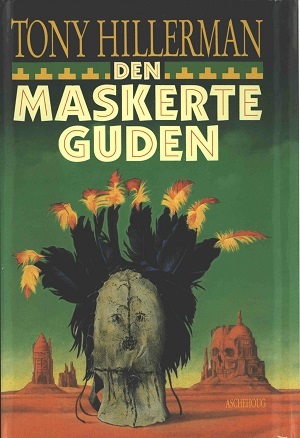 The cover was designed by Bernard Blatch and features an illustration of the mask of Talking God in the foreground with sandstone formations in the background. In addition, one of the sandstone formations also shows a skull merging with the U.S. capitol building as a sort of visual illusion. Unlike many Hillerman novels, a great deal of the book takes place in Washington, D.C. rather than in the Southwest. Format: Hardback, 21.2 x 13.3 cm. Binding: Bright red boards with a yellow design bordering the front and back cover. The author name, printed in white, and the title, printed in yellow, are printed vertically on the spine.